Today was a day that didn’t go as planned, but in a good way. We meant to ride our bikes, as is typical for us on a Thursday morning, but in the end my husband suggested that we spend the day on the coast. And what a fun day it turned out to be. 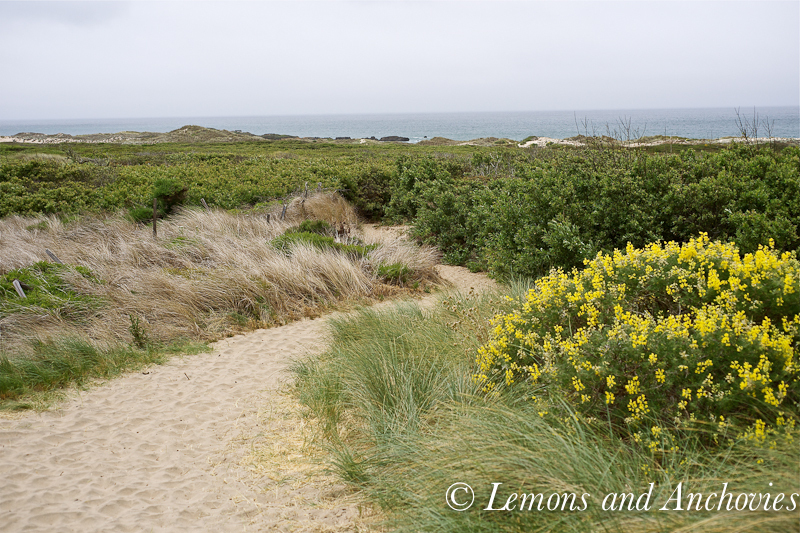 We walked on the beach, along the cliffs, on the dunes, took pictures of flowers and even rescued a bicycling trio who decided that their bikes were no match for the headwinds on Highway 1. 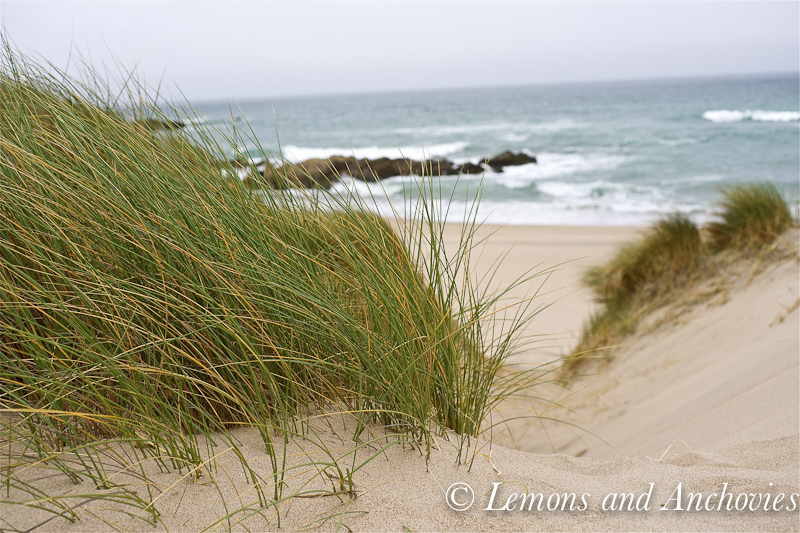 Although it wasn’t sunny and warm on the coast today, a lazy day is just what the doctor ordered. Next week will mark the beginning of our summer travels and visiting friends/family so it was nice to have some downtime. Besides, I never turn down an invitation to be near the ocean…never. Hot day or cold, foggy or clear, it doesn’t matter. There’s something about walking on the sand and looking at the vast expanse of the blue/gray/green ocean that I never tire of. 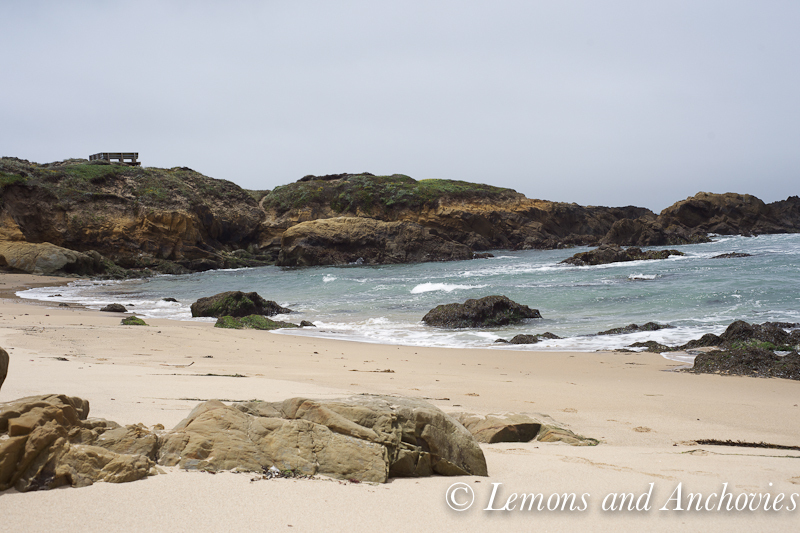 Then we get to this beach and have it all to ourselves. We actually went beach-hopping, visiting three others besides this one, but my photography is still inconsistent and I played around with the aperture and shutter speed. Sadly, I had to reject the other images. After our last beach stop, we stopped by Swanton Berry Farm in Davenport (about 35 miles south of Half Moon Bay and 12 miles north of Santa Cruz). I thought I might pick some olallieberries to make jam for the first time but I couldn’t resist just picking up three jars instead. Whew, did you get all that? Olallieberries were first developed in 1935 in Oregon. Their name is derived from the Chinook word for berry. If this is correct then aren’t they, in effect, “berryberries”? Just wondering. At any rate, the berries have never been productive in Oregon and they are primarily grown here in California. Good for me! Before finally heading home, we decided to stop by a roadside coffee shop for some tea. 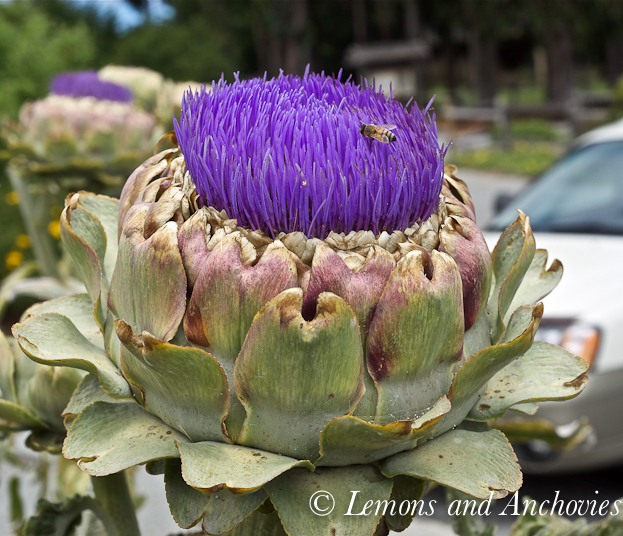 Along the way, we met this flowering artichoke, as well as the cycling trio I mentioned earlier. 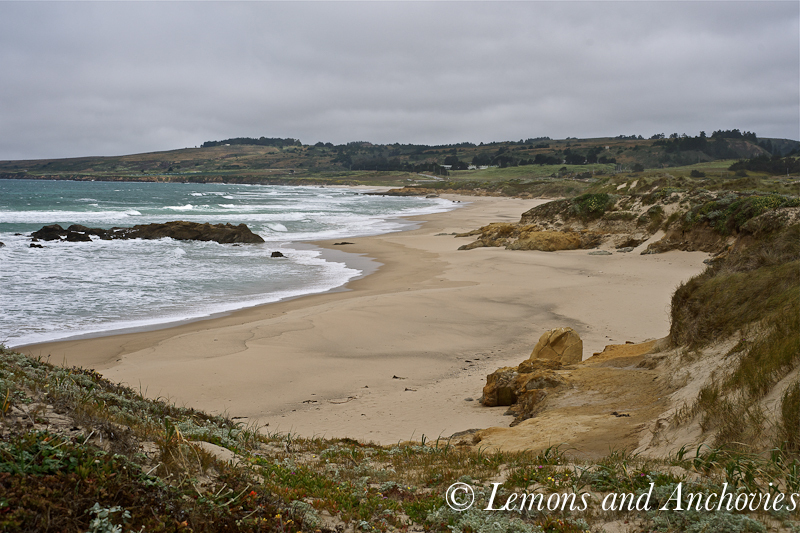 It was early afternoon by this time and the wind had picked up along the coast. The three riders were twenty five miles away from their car so the couple asked us to give them a lift to their car while their daughter stayed behind with their bikes. We don’t normally do this but my husband and I understand how hard it is to continue riding when you’re tired. We would appreciate the same courtesy extended to us if the roles were reversed. In the end, we exchanged contact information and considered ourselves two friends richer. We not only got great tips about cycling all over Switzerland but we also now have an open invitation to visit them in southern California. When we finally arrived home, I couldn’t resist making something with the jam. I wasn’t willing to wait until breakfast tomorrow morning to have a taste so I thought to make thumbprint cookies. If you’ve read my other posts, you’ll know that I’m not a big cookie baker but my desire to enjoy the jam eclipsed any reservations I had about another cookie recipe. I was very pleased with the results. The cookies were very easy to make. I liked the powdery texture of the confectioner’s sugar against the crumbly, buttery, slightly grainy cookie and the sweet/tart olallieberry jam. The jam is a low-sugar variety–just the way I like it. The berry flavor was as deep as the red-violet hue of the jam and satisfied my craving quite nicely. 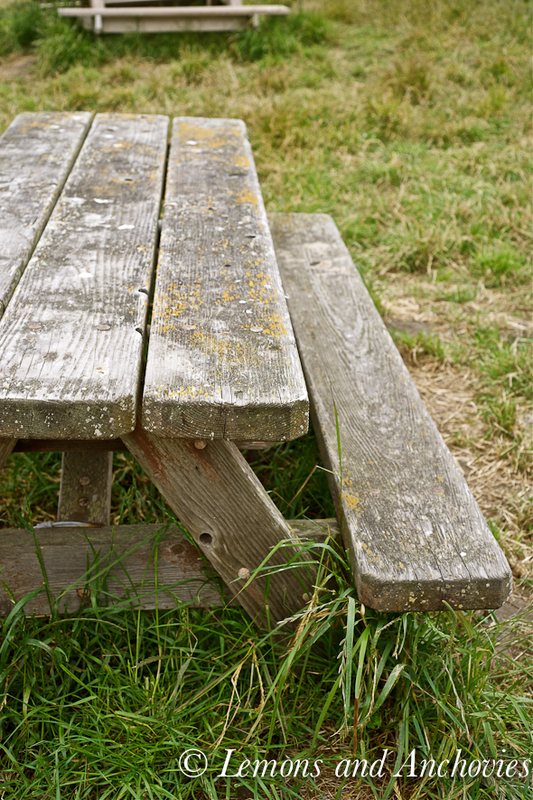 If you are ever in the area, here’s more information about Swanton Berry Farm. Preheat the oven to 350ºF. Prepare two baking sheets by lining them with a silicone mat or parchment paper. Whisk together the ground nuts and the flour. Beat the butter and sugar on medium speed (using a stand mixer fitted with the paddle attachment) until light and fluffy, about 3-4 minutes. Add both extracts and beat until blended. On low speed, gradually add the nut/flour mixture and mix only until it is incorporated into the dough. Measure a teaspoonful of dough and roll it between your palms to form a ball. Place each ball two inches apart on the baking sheets. Using your thumb or a 1/2 teaspoon measuring spoon like I did, press into the center of the ball to create a well. Bake for 15-18 minutes, remembering to rotate the baking sheets halfway through the cooking time. This will ensure even cooking. When the cookies are done they should be only slightly colored. Let the cookies rest on the baking sheets for two minutes before transferring them to a wire rack. Sprinkle with confectioner’s sugar. 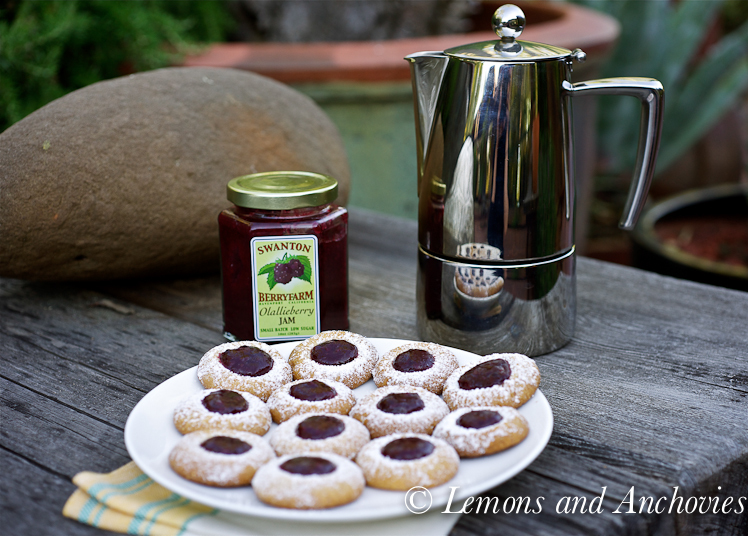 Bring the jam to a boil over low heat and fill the wells in the cookies with the hot jam. Cool to room temperature. Note: This recipe is supposed to make 60 cookies but I got 75. I guess mine were a lot smaller than Ms. Greenspan intended. Mine were finished baking at the 12-minute mark. Wasn’t that fun, Lisa? We used to pick cherries when we were little. I’ll never forget it. These cookies look amazing! They could easily have come from a professional kitchen. And I loved hearing about all these unique berry hybrids. What a beautiful post! Such stunning landscape and such scrumptious food! Monet, you’re too too kind. Thanks so much! I’ve never heard of any of these berries! Need to keep my eye open next time for them… I have such a soft spot for thumbprint cookies! Beautiful pictures!! I had never heard of that berry before this week, now I’m seeing it more and more. That artichoke is gorgeous and your cookies look so very very good! Thanks, Dennis! It was my first time seeing a blooming artichoke–had to share it. I had never heard of tayberries or olallieberries (loved the berryberries!). I bet that jam tasted fantastic. Your cookies look professional, even if you don’t bake cookies often!! Wonderful! These cookies are just perfect on that beautiful wooden tables (and even more perfect in our bellies! )… almost like multiple homages to yesteryear. 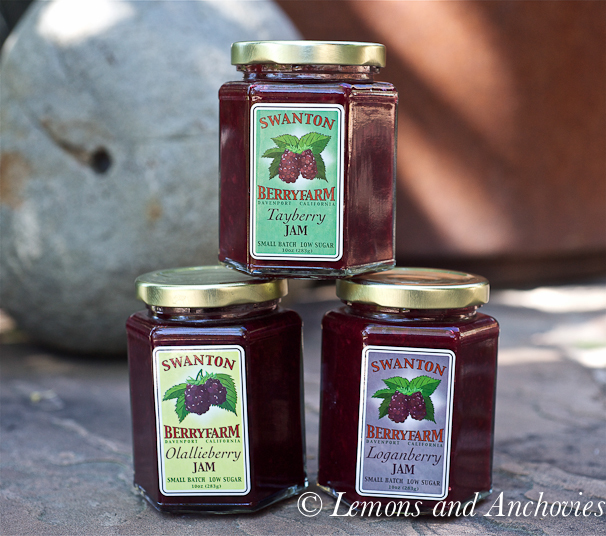 We discovered the Swanton Berry Farm during our latest roadtrip – and I brought back some of their Olallieberry jams, too. We don’t get these berries here in Germany, therefor I was especially excited! Thanks, Patty! The cookies were actually better the next day! Everything about this post is perfect: the pictures of the beach, the little, plump and fruity cookies… Good work! Wish I was there. Lauren, thanks so much! It’s the little things in life, right? These cookies look lovely. This is the first time I’ve heard of any of these berries, so thanks for sharing! So pretty and I love the name of the jam, fun! Beautiful cookie presentation and recipe! I think your photos look great! 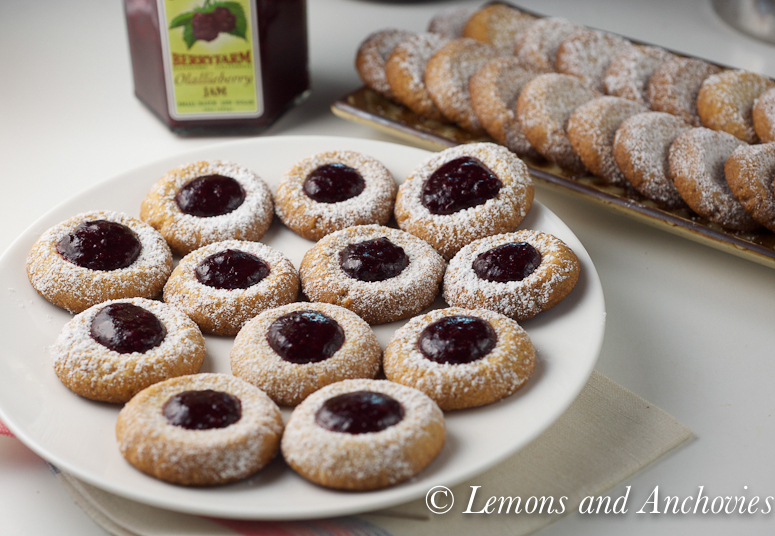 And the cookies…well, thumbprints are a true favorite! Wow, what a fun and full day! Discovering new jams, spotting humongous artichokes, playing along the shore, and making cookies, too! What a wonderful day! The cookies look beautiful. Fantastic pictures of the beach! And your thumbprint cookies look delicious – never heard of olallieberries before – but that sounds gorgeous. The photos are amazing, but your cookies look sumptuous !! 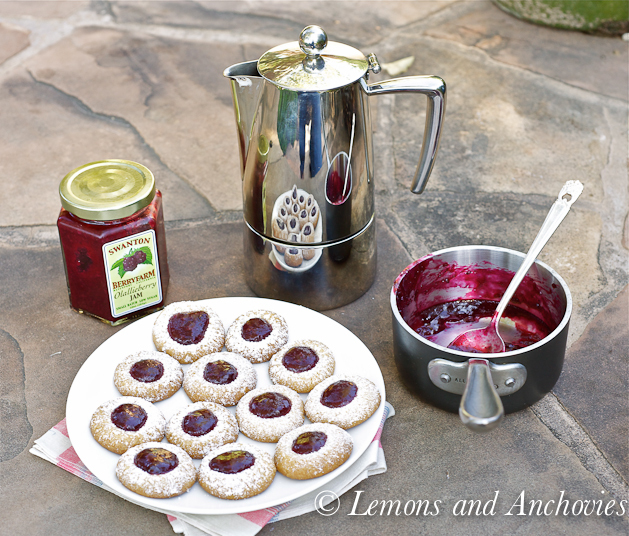 My mother in law makes her own raspberry and black berry jam will be using one of the batches to make these cookies !